The Tour Edge HL3 Triple Combo iron set features two HL3 hybrids, two Iron-Woods and three irons, to ensure you will have the most forgiving, accurate club for every shot. 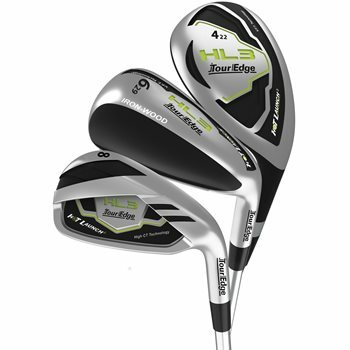 The HL3 hybrid is constructed from 450 SS hypersteel and incorporates a forged maraging steel face with variable face thickness technology to deliver the ultimate combination of forgiveness and power. The HL3 Iron-Woods feature increased head volumes for even more forgiveness on mid-iron shots and thin forged maraging steel face for exceptional distance performance. The HL3 undercut cavity irons provide more stability, higher launch angle, enhanced forgiveness and great feel on every shot.